The Knights came out strong in our only in-state match of the season. After an early back and forth match tied us 6-6, they blew open an 18-12 lead and looked like they might be in control of the first set. We showed some freshman power in scoring 6 straight points, three of which were kills by Isabel. It was tight back and forth the rest of the set until Becca ended it on a kill for the set win. The second set was more of the same except that after the early ties back and forth, it was us that opened up a 6 point lead 20-14, and then finished it out for the 25-19 win to go up 2-0 in sets. The third set was tight the whole way, and they really got some good kills from their go-to hitters and hit .243 as a team for that set. We fought well, and stayed tight, but couldn't come up with the points (or perhaps digs or blocks...) when we needed them at the end. The fourth set belonged solely to us, however. They were going hard to the middle, but we really shut them down, holding them to a hitting % of .029 while we hit a .333 for the strong finish at 25-14. Becca had an all-around great match with 17 kills, 16 digs and a hitting % of .349. Eliana had a great offensive game as well with 13 kills (.346), 2 assists and a service ace. Charlotte and Isabel both had three aces behind the service line, while Charlotte also added a team high 24 digs. Gabi added 7 kills hitting at .278, and had 2 blocks along with Isabel. Mel lead the team with 3 blocks, although they did out-block us as a team 14-9. We really played well and could see some great glimpses of the team we can be, which was great. We were scrappy, energetic, enthusiastic and together, and that's what we need to have every time we step on the court. Although the win was great, the highlight of the night might have been our dessert after the match. We had two rookie birthdays on the 23rd! And, they were not turning the same age--one 18, and one 19! 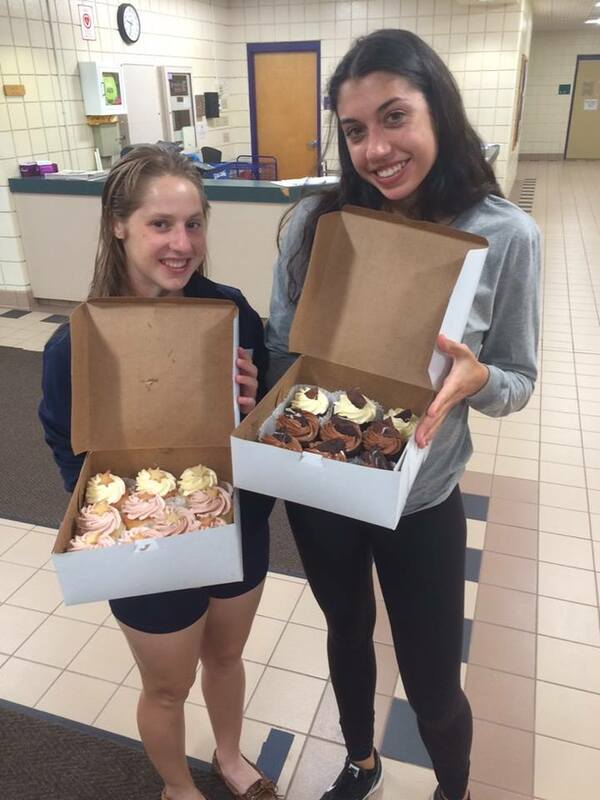 It's not every day that happens, but we were treated to two boxes of great cupcakes from Otter Creek Bakery! YUM! 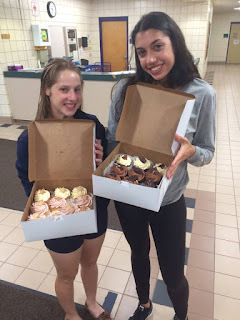 Happy Birthday, ladies! !